Manus (hand) and machina (machine) are often seen as the opposites. It’s either one or the other. The hand-made symbolises craftsmanship, tradition, individuality, exclusivity. Machine-made is mass, fast, modern, progressive. The Industrial Revolution of XVIII-XIX centuries was one of the most important steps for the industry and society. Modern production methods replaced manual workforce and lead to greater productivity. Two centuries later we are facing the so-called ‘Forth Industrial Revolution’ which impact may be even bigger. Soon robots and automation may replace the remaining manual work or simple manufacturing techniques. Even worse – artificial intelligence could soon replace our brains and creativity. 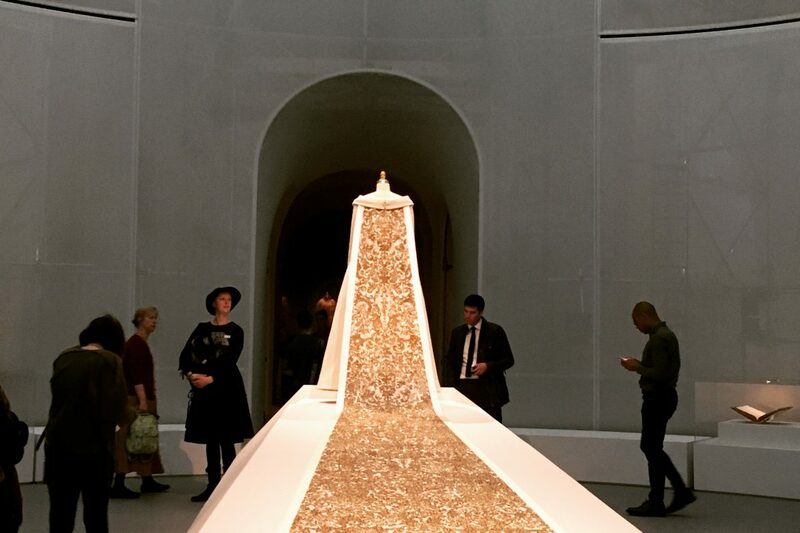 The Met exhibition however does not present hand-made fashion as opposed to machine-made. It does not categorise and it does not discriminate. On the contrary, it shows that hand and machine may go together. Many fashion designers use both to achieve the desired result. 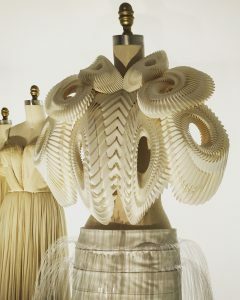 For some, like for Iris van Herpen, hand made becomes inspiration for machine and vice-versa. The acclaimed Dutch designer uses e.g. 3D printing to experiment with new forms and shapes, that couldn’t be achieved with traditional techniques and materials. Working with both helps her push innovation boundaries further and further. 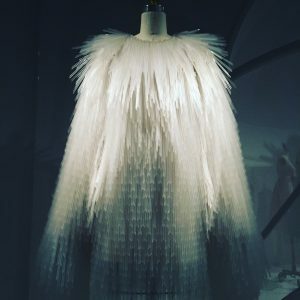 The wedding dress by Karl Lagerfeld for Chanel is a perfect example. Hand-sketched by Karl, it was then manipulated by the computer to achieve a random, pixelated pattern. It was then hand-painted, then machine printed, then again hand embroidered with stones and pearls. 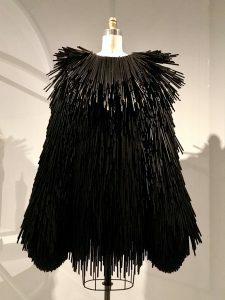 The exhibition presents many other examples where modern meets traditional: a dress by Garet Pugh hand-embroidered with plastic drinking straws, a creation of Hussein Chalayan that is hand-wired with 15,000 LED lights, dressed with elements that are 3D printed (Iris van Herpen or Threeasfour) or laser-cut (Balenciaga, Louis Vuitton). 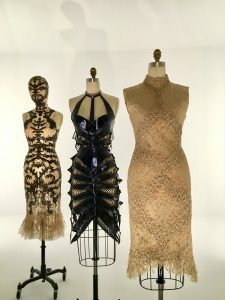 The exhibition also shows that machine can be as good as the hand (intricate laser-cut details) and plastic and LED can be as beautiful as stones and pearls. 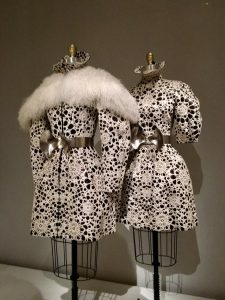 That’s why manus and machina should be seen not as opposite but as complementary. Linking them can create fashion pieces that are outstanding both as comes to beauty and originality as well as to their technical execution. 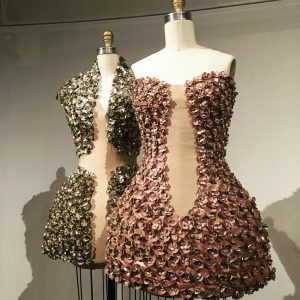 This somehow strange fusion may bring new forms, aesthetics and functionalities to both haute couture and pret-a-porter. Next postCan a scarf charge your phone?